Work on 14th Street between the Chattanooga Choo Choo and the Terminal is part of a plan to turn the area into an entertainment district. 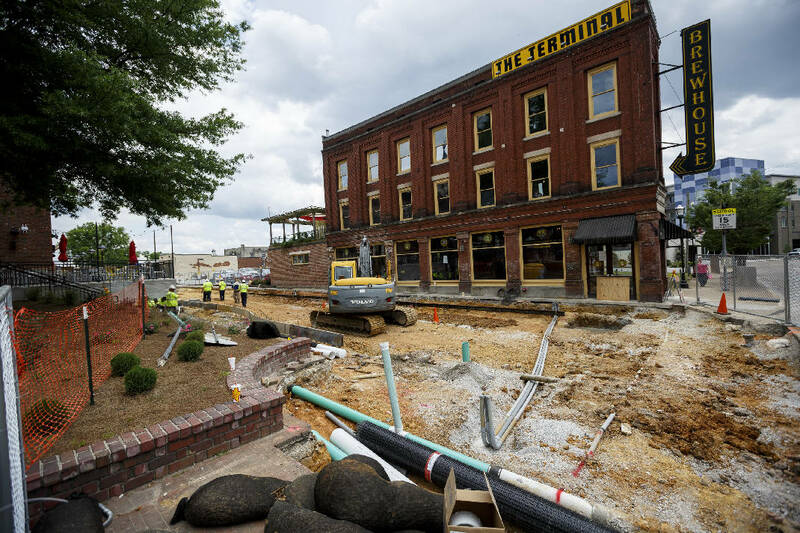 When completed, 14th Street between the Choo Choo and Terminal BrewHouse will have a new, pedestrian-friendly look and function — and maybe even a new name. When Matt Lewis opened the Terminal BrewHouse just south of the Chattanooga Choo Choo in 2009, he was well aware that patrons and tourists at the iconic attraction next door were being steered away from his restaurant and brewery. It wasn't personal, he knew, but he was also knew that the prevailing thinking was: "You don't take a left out of the Choo Choo," he says. "It was mainly because there was nothing to do, but also there were some safety concerns." All that has changed, and it could change even more with the completion later this summer of a revamped 14th Street, the short stretch of road that runs between the Terminal and the Choo Choo from Market Street to Rossville Avenue. Even the street name could change after an application was submitted to the city this week to rename it Station Street. When the work is finished in late July, the thoroughfare will be more pedestrian-friendly and can easily be blocked off with removable traffic posts for street parties, outdoor concerts or even busy weekends. Once nothing more than a back alley used for Choo Choo deliveries and access to the few businesses located there, 14th Street is now being seen by city officials and business owners in the area as a destination place, as well as somewhere to hang out while you decide which venue or restaurant to patronize. "I see comedy and music being the traffic generator for the Southside," says Choo Choo President Adam Kinsey. But the changing face of 14th Street is part of a larger move in the Southside to create something akin to the city's entertainment district around the Tennessee Aquarium, but with more things for adults to do. Attractions near the aquarium tend to lean toward family activities. Lewis says he always believed the area around Main Street, which was dominated by boarded-up buildings when he opened the BrewHouse, had the potential for a rebirth. Today, when he looks out the window of the triangular-shaped building that was once a black-owned hotel, Lewis feels like he bought a lottery ticket that took a while to payoff. "We've seen the neighborhood come up, and it's exciting," he says. Since 2009, the Southside area has seen tremendous changes with a rush of new restaurants, art galleries, shops, music and comedy venues, a winery and residential neighborhoods. The Choo Choo is undergoing a multi-million dollar renovation and has added restaurants and venues such as Stir, a restaurant/bar with high-end drinks, The Comedy Catch and the Revelry Room. It will soon add the Nashville-based Frothy Monkey restaurant to its list of eateries and Songbirds Timeless Guitars, a world-class guitar museum, will open in October. Track 29 opened in 2012, and the Revelry Room opened this year and both have brought nationally known music acts to town, including Jack White, Shinedown and Lucinda Williams. Nearby, Main and Market streets have also seen the opening of restaurants such as Blue Orleans, Flying Squirrel, Urban Stack, Slicks, Clyde's on Main and Taqueria Jalisco. Stir and The Comedy Catch have side patios that face 14th Street for dining al fresco, and Kinsey says they planned for outdoor concerts when they designed the Revelry Room. Power hooks-up were installed and dressing and lounge rooms for the musicians are located in the back, near the intersection of 14th Street and Rossville Avenue, where an outdoor stage would likely be placed. Fourteenth Street is currently undergoing some major reconstruction work, all of which is being planned and funded by a collaboration between the Choo Choo and the city. The Choo Choo has committed about $100,000 to the project, while the Benwood Foundation has pledged $190,000. The city, specifically the Transportation and Public Works departments, is spending $149,500 on the project. Tennessee American Water Co. and the Electric Power Board have already relocated water mains and power lines under the street, and crews are currently digging out the old road so it can be relaid with light and dark gray concrete pavers. The differing hues will delineate between walking areas and automobile paths. There will be no raised sidewalks so the entire space can be used comfortably for pedestrians when the street is closed for special events or busy weekends. There will be no on-street parking. Several Southside business owners, as well as city officials, believe revamping 14th Street is central to growing the area. "Our streets are one of our great public spaces," says Eric Asboe, public engagement coordinator with Chattanooga. "They are most often used to get people to one place or another, but they are also a place to spend time and they shape how the area and the businesses are used. "Creating great public spaces is what we do. How can we will enliven those spaces? The new outdoor areas and entrances there are activating that space beyond just being able to drive through." When completed, 14th Street should be a pedestrian-friendly thoroughfare connecting the Choo Choo and other new businesses, including shops and restaurants near the intersection of Market and Main streets. The street is also being designed to include overhead string lighting so it can easily be closed off for block parties or busy weekends. "Chattanoogans love a street party, but there isn't a convenient street to close down," says Kinsey, who has spearheaded an informal group of about nine business owners to work with various city departments to get the project done. Songbirds Timeless Guitars President Johnny E. Smith gives Kinsey much of the credit for the project, but says everyone, including city residents and tourists, will benefit. "This is nothing but a huge benefit for everyone," he says. "People will be able to park their car and go eat at any number of places. This gives us something unique that we've never had before — maybe Patten Parkway. Real pedestrian-friendly areas can be awesome. You can get out of your car and have many different options." Max Poppel, along with business partner Dan Rose, worked with the city on a similar project on Johnson Street between their businesses The Flying Squirrel and The Crash Pad, both just around the corner from 14th Street. The two also recently purchased a building and a separate plot of land on 14th and, while Poppel says they are not sure what they will do with it, the final products will fit with everything else that is going on. "I'm a big fan of walkable, drivable, livable streets," Poppel says. "It's exciting to see that block come to life." Hillary Libby plans to open Wild Flower Tea Shop & Apothecary in early July at 1423 Market St. across from the Choo Choo. She says the revitalization of the area was a factor when she chose the location. "The Choo Choo renovation and all of the new development in the area lent itself to me wanting to be there," she says. "My business is going to require some foot traffic. As it was a few years ago, I don't think there was enough foot traffic to support it." Kinsey says he hasn't heard about any plans for a grand-reopening celebration when 14th Street is reopened, and he doesn't have any outdoor concerts yet on the books, but people are discussing ideas for future events. Several business owners in the area, he says, are discussing a more formal group similar to the North Shore Merchants Collective, which works together to promote businesses in the area. "This has been a great private/public project with people working together to make an awesome street for everyone to enjoy," he says.